It wasn’t actually a hurricane, but it sure sounded like one. 40 MPH ESE winds and lashing sideways rain pummelled Cape Ann on Saturday. Sunday was just heavy wind from the West. For the first time in our charter history, we canceled both weekend trips ahead of time. It was a good move. Now the boat is winterized and waiting to be pulled out and placed under shrinkwrap for the winter. We’re going to miss the ease of getting wet from a boat until April. Saturday was a no go, but Sunday had less wind. Laurent Dubois was our only customer. Peter and Pat were crew. The Captain and I took our video cameras to keep in practice with rock steadiness. We decided that Stone Garage, near Bemo Ledge, looked good. I anchored in 23 feet of water and it was 53 degrees on the surface. Laurent reported that it was 50 degrees at 35 feet. There was over 20 feet of visibility. The air was 45 degrees and the sun was bright. As long as you were seated on one of the blue boxes that house our batteries, you were out of the wind and warm enough. The tide was almost high. I saw limpets that acted like abalones when I tried to pry them off their rocks. The orange sheath tunicates were in shreds on rocks. I swam out to the sand and then back towards the boat and shore. The sun behind my back shone of the white faces of the rocky ledge as I returned. It was glorious. Pete had cooked chili on the way out, so I got to hold a hot cup of it. We decided that one and done was the rule of the day. The marina had moved us to F Dock to begin dredging on J Dock. We moved our electrical cord and water hose and sign as though it were the end of the season. Next Saturday, we’ll be greeting customers for the last weekend of the season. Thanks to Curt Fowler for providing electronic copies of some shots he took off Easy Diver last Saturday. We had a full boat today and went south. On the way out of the harbor, we saw the Holland American Line’s Amsterdam at anchor just inside the breakwater. As I turned the corner to go to Bass Rocks, I noticed it was bumpier than we’d seen it during our drive-around earlier. Oh well, maybe it’ll flatten out later. I found a calm anchorage off Bass Rocks in about 25 feet of water. Paul Young, Charlotte Richardson, Laurent Dubois and Kurt Brown, Bill Myers and his friend Adam were in the water quickly. They reported visibility was good at about 20 feet, but the water temp had dropped back to 53 degrees. Paul found a sculpin and a flounder for Charlotte’s photo opportunities. Cal found a long string of abandoned pots just off shore. The wind didn’t lessen, but the water was calm enough for us who stayed dry to be comfortable. Pat made soup. Pete was putting Kurt through his final skills review for his basic scuba card from NAUI. He did fine. We decided to look for a more protected anchorage for the second dive. I found a good one on the eastern edge of Salt Island in about 22 feet of water. The island protected us from the wind and the surge was less there too. Bill and Adam went exploring up in the lee between the island and shore. Laurent and Kurt went up wind towards the island and then turned left out to sea. They reported the visibility was again 20 feet and the water temp 53. Adam found a jacket underwater and retrieved it as treasure. Bill found some lobsters. Everyone pronounced the site to be a good one and not a place we’d been before. The ride home was bumpy because we were traveling into the 2-3 foot seas and the wind was up to 15-20 mph. Whitecaps were the give-away that it was at least 15 mph. Not many other boats were out. The tide was low, but coming in and we were able to scoot under the Blynman Bridge without having to ask for a lift. Somehow that makes returning seem less troublesome because we don’t have to wait. Just two more charter weekends left in our season. Long, low rollers from the east were breaking in huge plumes on Halibut Point. The Captain declared we should “turn around…NOW!” I cut the circle too tightly and a whole pot of Pete’s freshly made chili hit the floor in the galley. We’re talking about roughly a gallon of pungent red lunch splashed on every surface down there. 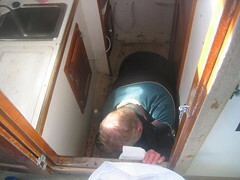 As I motored back towards Lanesville, Peter, half-dressed in his drysuit, began cleaning up the mess. This involved unscrewing the stairs and taking up the floorboard, a little dust pan and a whole roll of paper towels. Pat and Laurent helped too. Laurent dunked the floorboard and stairs by hand off the swim platform. Then he scrubbed them clean. What a great customer! The first site ended up being Lanesville Shores, just northeast of Lanes Cove. I set the anchor in 33 feet of water. It was 57 degrees from the surface to the bottom. All the salps were gone. My video camera was put to good use filming a little rock gunnel that was almost friendly. I also shot a scarlet psolus and a crab that was cleaning barnicles off a rock with little cunners looking over his shoulder for crumbs. 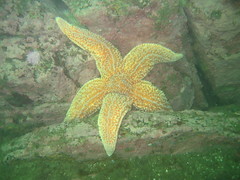 Peter, Jacki Kronenberg, and Curt Fowler found huge starfish that were about 12 inches across. Curt also took a picture of a too-big lobster. Visibility was about 15-20 feet. Thanks to Pat, we had chicken noodle soup to warm our hands between dives. The second site was a little closer to the Annisquam River, S & M. This is a great place for lobsters. Since it was low tide, I was careful not to run aground on the huge rock that splits the center of the site. Again, the water was 57 degrees from the surface to 27 feet. The bottom was dusty and silty in places where the hunters had been scrabbling around. In other places, Pete and Jacki found low, round pink rocks and dust-covered skates. He said there were lots of great, big lobsters and lots of tiny ones, but none in the middle. I found two scarlet psoluses to video here. Visibility was variable from 5-15 feet, depending on whose trail you crossed. The light from the sun was low and at an angle. It made for dramatic images of cunner and ghost traps against the bare rock. There were hardly any other boats out today. Maybe they’ve called it a season. “The visibility would have been great if it weren’t for all that stuff in the water.” The stuff is salps. They were thick outside of Rowe’s Cove, a.k.a. Smiling Fish Cove, in Rockport. The water temperature was 57 at 42 feet, according to Pete and Laurent. The surge was bringing mats of salps in towards shore, so the visibility up in the warmer shallows was less than 10 feet. In the deeper water, the visibility was about 20 feet. Veronica, Pete, and Pat were crew. Joe Finkhouse, Laurent Dubois, and Jim Castelli were customers. 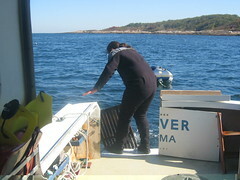 We made the second dive at the very outside northwestern tip of Folly Point. It was slack, high, full moon tide. There was hardly anyone else out. We’d agreed to go somewhere we rarely go to add variety to our reports on non-native species to Salem Sound Coastwatch. This site is treacherous during mid-tide because its currents are very strong. It is also very uncomfortable to anchor here when there are lots of boats passing off shore. Their wakes rock everyone without a break. But not today. The water was murkier than in Rockport but the temperature was still 57 all the way to the bottom. The site consists of a large pile of boulders poking out from shore that might have once been part of a pier or dock. They housed many tiny anemones, shoulder to shoulder, on every rocky face. It’s good to see them here because they’re almost absent from inside Folly Cove. I saw lots of ghost traps and yards of abandoned rope. There were pollack and cunner of fair size hiding in the deep crevasses between boulders. Laurent retrieved a thirty pound weight belt as his catch of the day. We unloaded gear up a flat ramp and into a hot parking lot. It was 81 degrees as we called it quits for a great three day weekend. There are just three more weekends in our charter season. Too bad that they probably won’t be like today. What a bee-yoo-tee-full day! There was almost no wind at all. There was not a cloud in the sky. The ocean was flat calm on the north side of the cape, so that’s where we went. We had Richard Brandolini and Susan, Alan Budreau and Gaylene, Laurent and Jim as customers today. Crew was Veronica, Peter and Pat. Because Gaylene was recently certified and Susan was a bubble-watcher, I wanted a flat, pretty place for the first dive. I got it at Calf Cove inside Folly Cove. I anchored in about 25 feet of water. It was 55 degrees on the surface and, according to Laurent, at 50 feet too. The tide was coming in and salps were everywhere. Peter caught a northern pipefish and showed it to Susan in a soup cup. It launched itself right out of the cup again before we got a really good look at it. Gaylene and Alan saw a rust red sea raven. Visibility was about 15-20 feet. Since everyone did so well in Folly Cove, I chose a more exposed site for the second dive – around the corner off the cemetery along Lanesville Shores. Again we were anchored in about 25 feet of water, but this time the visibility wasn’t as good at about 10-15 feet. There were fewer salps also. The highlight of the day was Pat seeing a four foot long torpedo ray swimming beside her as she was hunting for lobsters. Of course, there were no cameras around at that moment. It was so comfortable that we didn’t even cook soup. Like Veronica says, it was one of those last chocoloate cookie in the bag kind of days. There won’t be many more like it this season. Tomorrow is supposed to be even warmer/better. It had been blowing out of the northeast for two days. We saw the wavy results on the south side of the cape as we drove around looking for the best dive sites. There must have been some southeasterly blowing too because the waves were cresting from that direction into Magnolia harbor. Not good. As we circumnavigated with our Dunkin and corn muffins, we found the near north side would be do-able, although not great. Maybe Hodgkins Cove or maybe outside Plum Cove would be good enough. It was only after we boarded the customers and headed up the river that the wind freshened and was blowing into our teeth. The conditions were going downhill fast. We decided to turn around and go into the harbor instead. At least it wouldn’t be too bouncy there. Cathy and Bill Myers, Laurent Dubois, Joe Finkhouse, Kevin and Linsley Mordasky were mellow about it all. I put the boat in about 25 feet of water in the most protected part of the cove. The water was 55 degrees. They suited up under the bellowing announcer for the bicycle race at Stage Fort Park which was up wind of our anchorage near the three big rocks off the popple beach there. The wind continued to build. It was sunny, but cold. We saw a seal near the biggest of the rocks the top of which was still underwater. We made soup and waited for the hunters to return. They came back with full bags and surprised looks on their faces. The visibility was about 15-20 feet. The pickings had been very good for this time of year and this place. The Captain decided we’d find a second spot with more protection for the non-divers. He picked Niles Beach’s rocky western edge. This time we anchored using a mooring ball whose owner’s sailboat was gone for the winter. It would make tying up easy and leaving even easier. Everyone made a second dive. Kevin said there were “…me-e-e-elions and me-e-e-e-e-lions of salps” in the water. Linsley said it was like diving in a wet snowstorm. These critters are gelatinous and transparent. They look a little like jellyfish but have no sting. 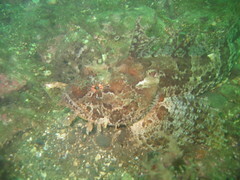 Bill said he saw a very large decorator crab and three skates. The visibility had been less at about 10-15 feet. Again the hunters had unseasonable success. I made another pot of soup and it was consumed by the returning divers. Chicken noodle tastes like ambrosia when you’re cold. Peter, Pat and Kathy Cardinale were crew today. We were glad to have the help. Tomorrow is supposed to be warmer. Let’s hope it’s calmer as well.